It’s been a decade of launching local businesses for the J Herbert Smith Centre for Technology Management and Entrepreneurship (TME). 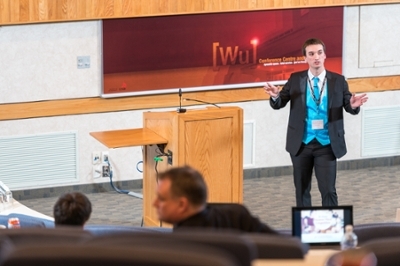 TME at the University of New Brunswick is hosting its 10th annual Student Pitch Competition on Thursday, March 17 at the Wu Centre. Student entrepreneurs pitch their ideas to the audience, which is comprised of judges, the public, and their fellow students. They pitch for three minutes each, followed by a three-minute question and answer period. Thirty new ideas will be introduced at the event. The pitch competitions are open for public viewing, with pitch periods beginning at 1:20, 2:45, and 4:20 p.m. Since its inception, TME’s Student Pitch Competition has resulted in several startups including Resson Aerospace, Hotspot Parking, and Smart Skin Technologies. The event includes an awards dinner, where students are hoping to walk away with cash prizes. Last year’s event saw more than $8,000 in prizes awarded to students.